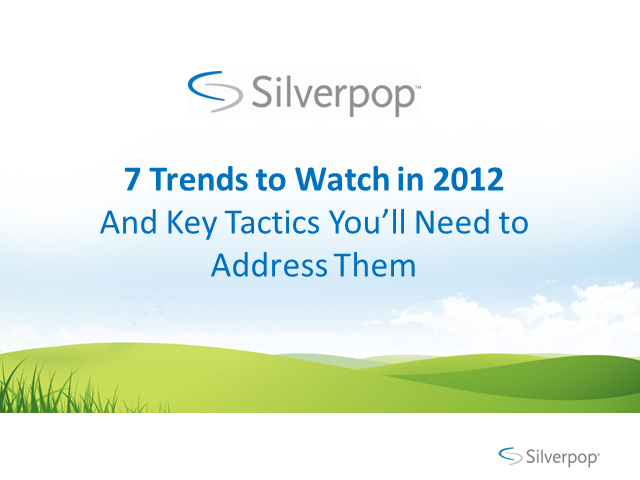 A 35 minute webinar, packed with 2012 trends, and tactics to make them work for you! Consumers are on the move and eager to engage with brands that provide seamless interactions across channels and devices, but often the experience they encounter is fragmented. Successful marketers realize the buyer journey must be better integrated, but as channels continue to proliferate, it’s challenging to get the full picture of what the customer experience looks like. Prospective customers are more difficult to entice than ever, and retaining them is equally challenging. With contacts increasingly seeking a seamless experience across a company’s call centre, emails, website and mobile channels, marketers can step up to help exceed prospect and customer expectations, and even achieve higher lead-to-sale conversion and retention rates. In this session, Silverpop Marketing Evangelist Ellen Valentine and Genesys Solution Foundry Director, Cliff Bell, will share best practices for how you can deliver the right cross-channel communications and content at this great moment of opportunity. Join Silverpop Marketing Expert Ellen Valentine, as she reviews customer journey planning techniques and how to use the output from this strategic work to improve your digital marketing efforts. In this book club webinar, Daniel Rowles, author of Mobile Marketing, will explore the key technologies, opportunities and challenges of Mobile Marketing. The session will explore how we can optimise every stage of our digital marketing to give the best experience to users across a range of mobile devices. As well as providing a range of tools and techniques that attendees will be able to take away and use straight away, Daniel will also explore what the future of Mobile holds for us. Join Pam and Silverpop's very own Ellen Valentine for a deep dive into this expert new book. UnSelling is about everything but the sell. It's about the big picture: creating repeat customers, not one-time buyers. Create loyal clients that refer others, not faceless numbers. Becoming the go-to company for something, before they even need you. When every customer, and indeed prospective customer, is within easy access of broadcasting an opinion on your brand, your service, your product, what do you do? How do you turn contacts into engaged customers, and maybe even brand ambassadors? Jason Thibeault and Kirby Wandsworth have some ideas on this, and they want to share them with you! Join them for the latest Silverpop Book Club webinar where they’ll discuss highlights and key takeaways from their book Recommend This! Register now and join us on live on Wednesday 13 August at 4pm GMT; alternatively register now and we’ll let you know as soon as the recording is live to watch on demand. Marketing and presentations go hand in hand; whether it’s a pitch, a presentation to the board, or simply a staff briefing, most marketers accept that presentations are part and parcel of the job. Whether you’re a seasoned on-stage rock star or just starting out, this Silverpop Book Club webinar will introduce you to the formula behind powerful presentations. The book; The Presentation Lab brings together ten years of presentation experience and development allowing readers to access the very latest thinking and apply it to their own presentations. Author Simon Morton founded a consultancy and design service that started in a spare bedroom in the UK and went on to become one of the best regarded presentation companies in the world. Joe’s third book is titled: Epic Content Marketing: How to Tell a Different Story, Break through the Clutter, and Win More Customers by Marketing Less which takes business owners and marketers from A-to-Z toward creating a content marketing strategy that works to grow their business. Join Joe and Silverpop’s Ellen Valentine on 6 March for a webinar introduction to Epic Content Marketing and learn how to break through the clutter and tell your story. Author of ‘Crush It’ and ‘The Thank You Economy’ Gary Vaynerchuk joins Silverpop for a special Silverpop Book Club Webinar on Thursday 6 February. Register here to join us at 2.30pm and here from the author himself about ‘Jab, Jab, Jab, Right Hook!’ a compelling ‘How-To’ book on telling your story in a noisy, social world. Known as @GaryVee to his 1 million plus twitter fanbase, Vaynerchuck is an author and entrepreneur with an enviable CV. He developed his social media expert credentials whilst running winelibrary.com; turning it into a $45million business, before launching Vaynermedia in 2009 to help companies like GE, PepsiCo and the NY Jets. Gary is also an angel investor in a range of Tumblr, Uber, Birchbox and Twitter and an inspirational and entertaining public speaker. It's not every day an ex-BBC presenter and Media Training expert shares his secrets' in a book, and very rarely does Sir Stuart Rose, former Chairman and CEO of Marks and Spencer comment: " If you want to understand how to get the media on-side, in good times or bad this book is a good place to start". Attract, engage, and inspire your customers with an “Optimize and Socialize” content marketing strategy. Learn to incorporate essential content optimization and social media engagement principles thereby increasing your ability to acquire and engage relevant customers online. Optimize provides insights from Lee Odden, one of the leading authorities on Content and Online Marketing. Scott Stratten is the President of Un-Marketing. He is an expert in Viral, Social, and Authentic Marketing which he calls Un-Marketing. With two best-selling books, and a third on the way entitled “QR Codes Kill Kittens”. Scott now has over 150,000 people follow his daily rantings on Twitter and was named one of the top 5 social media influencers in the world on Forbes.com. Listen to Scott discuss his latest book 'QR Codes Kills Kittens', including a question and answer session. You always knew digital was going to change things, but you didn’t realize how close to home it would hit. The only way to compete is to evolve. James McQuivey of Forrester Research has been teaching people how to do this for over a decade. He’s gone into the biggest companies, even in traditional industries like insurance and consumer packaged goods, and changed the way they think about innovation. Now he’s sharing his approach with you. With examples from the gaming industry and beyond, this is a must-watch webinar. Brilliant Business-to-Business (B2B) Digital Marketing is the first ebook focusing on good practices for business-to-business marketing! Join Rene as he explains his 7 steps to Brilliant B2B Digital Marketing! As a starting point or a refresher, join us and make your marketing brilliant! Hear Bryony Thomas, author of Watertight Marketing, explain 13 of the most common profit ‘leaks’ in business and learn how to begin to make your marketing ‘watertight’. Your customers are online – but not always! -How to grow your database using, online, offline and mobile methods. From coach to first class – creating personalised experiences! -How to create campaigns unique to your customer’s preferences and behaviour. What happens in Vegas, doesn’t have to stay in Vegas! -How to use post booking communications to optimise your marketing ROI, retain customers and gain brand loyalty. Whilst many of us look forward to welcoming the games to our capital, we still need to ensure that your marketing doesn’t finish last behind your competitors. Now is more important than ever to ensure you maximise the effectiveness of your email campaigns. So whether it’s business or usual or you’re working from home during the games - join Silverpop’s webcast on the 7th August to learn how Automated Lead Nurturing can take your marketing to an elite level. Get more personal by getting more automated. Increase relevance and engage customers and prospects with messages that drive revenue.